﻿ Beautifully-Scented Products of a Quirky Nature by Scentopia, United Kingdom - available throughout the magical realms! Using superior-quality waxes and fragrance oils, Miss Malyss has created a special recipe blend candle with a burn time of over 30 hours, which captures the sweet and creamy essence of the Traditional Basilisk Brewery's original Butere Bier, and available in your house colours. Has Scentopia gone mad? The Colours and Scents don’t match! I’m afraid we have... but that’s the whimsical effect of the magical realms. We post our products to anywhere within the UK, including highlands and islands. For any other destinations, please contact us for shipping costs prior to making an order. All payments are made via PayPal; we aim to dispatch all orders within three days of receiving payment and confirmation of dispatch will be sent to you by email at this time. How about a different stocking filler? 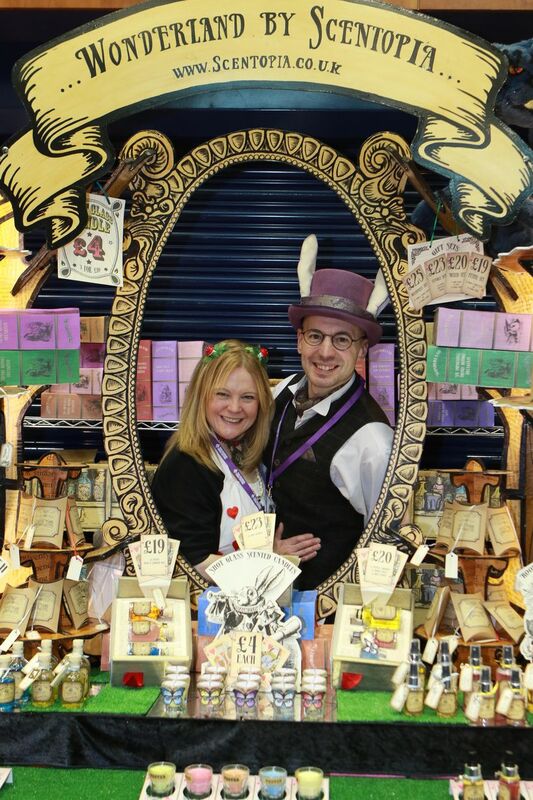 The Hatter's Mystery Travel bag has always been a popular choice for folk to get a sample of our vast range of Wonderland smells, each one containing five x 10ml (100+ whiffles) random room & fabric sprays chosen from our entire range of over forty flavours. At a recent event we had two flavours fighting for first place: Red Velvet Cake and Parma Violets. Which do you think is the best? Maybe neither and another one of our flavours is dear to your heart. To help you make a decision we're offering 12% off everything until 9th September 2018. Just use discount code THEBEST at the checkout. They say all good things come in threes, well we took that advice and you can now buy all your favourite Wonderland shot glass candles in sets of three - you can choose to mix and match or all three of the same flavour. Wonderland has so many interesting smells, from the Cinder Toffee Bee Hives, Parma Violet Lake, Red Velvet Mountain, to Knave of Hearts Cherry Bakewell Tarts, so the Hatter has stuffed them into his travel bag. Grab one (or loads if you travel like J-Lo) and get a random selection of over 40 Wonderland scents! Keep your eyes on our Facebook page as we have something special coming for a special person. We have an official artist! Gemma Hanson AKA Original Pumpkin has been doing a spiffing job of transforming the Tenniel Alice in Wonderland artwork for us. Elliot and the Scentopia family love their products. So they thought it might be nice to help you enjoy that love too, this Valentine's Day, by offering a discount on all of our products. Simply use the code HEART14 at the checkout, and instantly receive 14% discount on your order. Save Valentine's Day from mediocrity! Offer ends Sunday 11th Feb. This weekend, we returned to where our comic con adventures began, at OK True Believers in Cheltenham. A lot has changed in the last year but it was great to get the same warm welcome from Stuart and his team. On another note, our photo was displayed in a Gloucester Live feature. How about a little Wonderland in Red Dwarf? The Cat (Danny John Jules) can't resist a good wash, especially with Lemon Meringue Pie, to the point he insisted on his fellow crewmates Rimmer (Chris Barrie) and Kryten (Robert Llewellyn) partaking of a little Wonderland too. The Snark Hunters were out in force at MCM Birmingham November 2017. The cat joined them for day one, to much interest from the public. Going to MCM Birmingham in November? We've got something special for the keen-eyed visitor. We have in our employ a group of Snark Hunters looking for their bounty, and if they are lucky they might even bag the dreaded Boojum. The hunters are quite generous, to the point that they will be offering out some of their Snark Hunter Reward Tokens, which can be reedeemed for oodles of discounts off everything at one of the Scentopia trading posts at the event. If you see the hunters at the event, say hi, compliment their attires or take a smashing photo and they are bound to be rewarding! We had a visit from Catherine Dyer of Stranger Things fame; on-screen a ruthless murderous agent, in Wonderland one of the loveliest event guests we have come across. She loved Parma Violets and took some back to the US. Lastly, a big thank you to David Bidwell (the organiser of Doncanster's Monster Comic Con) he could not have done more to accommodate all of us trading and visiting the event. Thanks, David and can't wait for next year. Who knew there was a bounty on Scentopia; a couple of Mandalorians caught up with us at Coventry Comic Con after hunting for us across the comic con markets for months. Fortunately it wasn't the cat's head they were looking for, but Parma Violets Cosplay Spray to freshen up Jabba's Palace a bit. This summer we had tea in the rain with the Mad Hatter. We asked him to try our new and experiemntal scents and he immediately mixed them all up into his teapot! He gave us his thanks and said they'd be great and convenient as teabags. So the Ingénieur mused for a while ... and The Hatter's Mystery Teabag was born. Not to be drunk you understand, the teabag contains five randomly-selected, extra-petite room & fabric sprays, from a range of over 20 scents. Explore the 'Specials' in our shop. Most popular product: Parma Violets, beating Pear Drops by a hair. "Stars of Time"" in Weston-super-Mare is not your average Comic Con, it's almost on the beach... and next to a fun fair... and feels more like a summer party. So it was under these unusual conditions that our cat made his first public appearance. Specially made for Scentopia by Heidi of Cowley's Angels Cosplay group, the cat was greeted by the public, eagar to take photos and stroke his fur. A huge success, he'll be back again next month for Cardiff Comic Con. Most popular product: Parma Violets Room and Fabric Spray. ..."That's mine! And that's mine! And all that's mine!". Danny John-Jules aka The Cat from Red Dwarf couldn't keep away from us, our Lemon Meringue Pie scent was like catnip to him. It was wonderful to see him taking the time to walk the floor and interact with the traders, and especially come back to spend time with us on day two. What an awesome guy. Most popular product: Cherry Bakewell Room and Fabric Spray. Most popular item for the weekend: Parma Violets Room & Fabric Spray closely followed by Cherry Bakewell. The early morning snow didn't deter hordes of cosplayers and convention fans at MCM Midlands in Telford, to the point that we hadn't finished setting up before purchases were required! Set-up the night before ... arriving at 8am on the day was a nightmare, as we queued in the snow to get our trader passes, along with lots of other people. This left us in a bit of kerfuffle, ending up with a very short time to build our display and set out our wares. Most popular product: Parma Violets Room & Fabric Spray by a clear mile. I say, what an understatement: OK True Believers Comic Festival at Cheltenham Race Course was much more than OK, it was great! Lady "Gruff" Darklis and The Ingénieur manned the Scentopia exhibit on the balcony with a great view of the entire arena. Without a doubt, the True Believers staff were exceedingly friendly, helpful and easy to find in their bright orange shirts! Lots of fantastic cosplayers, some of which we managed to capture for a photographic pose behind our Wonderland exhibit: facebook.com/ScentopiaUK. Go see and like your favourites. Most popular product: Rhubarb & Custard Shot Glass Candle (they will be available to buy online soon). If you have an event coming up and need a stall that's different, run by very friendly and professional traders, get in touch. We pride ourselves with making sure we attend our stalls for the full duration of the event, regardless of the success or lack thereof. If your event states an end-time of 4pm we will still be on full display and ready to accomodate your patrons until 4pm - and beyond, if required. We will never let you down with a no show once the booking is confirmed. We offer stallholder discount on all our products and will never be disparaging towards fellow stallholders or organisers, regardless of whether or not we are extended the same courtesy. We are accomodating of change. Sometimes things don't go according to plan - we do like to help make an event work out for all, as long as it doesn't negatively affect Scentopia. We don't mind competition but do ask that we are not situated in a proximity where scents may be confusing; our products are all about olfactory stimulation and sensation, which can be problematic when situated next to another stall offering strong-smelling foods, coffees, perfumes ... or lavender. We also have delicate ears, so we prefer not to be placed near sources of music, tannoys or loud sounds. We wholeheartedly believe that surrounding oneself with adorable items and curious fragrances is a wonderful way to relax and take a break from the humdrum routines of everyday life. Scentopia invites you to revitalise your senses with our range of handmade bubble baths, room sprays and scented candles - perfect for giving as gifts or keeping for yourself to enjoy. Become a Scentopian: your friends, family and home will thank you. Found a problem with our website? Please let us know, we want to fix it! Scentopia: for your Delectation and Delight. Simply procure items to your shopping basket, and in a jiffy you can pay through PayPal or by credit card. You can also buy on the ebay.co.uk emporium (but we'd rather you place your order from here). At only 17, Elliot left college to become a representative for beauty bathing products. Being a bathing enthusiast, Elliot saw an opportunity to make a business with unique products. Elliot may not be an expert, but he believes that good bathing products do not have to be made in a factory work-house; in fact he thinks that they should be made by a few men with a passion for good skin and exuberant smells. Elliot promises that he will not sell you a dog: everything Scentopia sells is homemade by our team, and is as natural as possible. Gruff is not a talkative woman; we assume this is because she is too busy being an ingenious thinker and a hard worker. When our team has forgotten important factors, she is stood there shaking her head, tutting and tapping her quill on her "thoroughly-noted" list. You can find Darklis lurking in the shadows of our office, sniggering at our spelling mistakes. André makes up for his fly-rink (Google it!) with his fantastic web-development skills, graphic designs and all round enthusiasm. André is usually the man behind our stall at events and he thinks that Elliot has some strong ideas that should be broadcasted. André is also the man behind the website you are currently on, only because he managed to convince Elliot that newspapers and carrier pigeons probably weren't the best idea. Here at Scentopia, we ensure all ingredients are vegan-friendly and as kind as possible to our patrons and the Empire (known and undiscovered territories). With this in mind, a charity dear to our hearts is The Racehorse Welfare Centre, where champions (retired through injury or end of their racing career) are looked after. A place where the going's always good - put me down for a couple of Guineas! Scentopia is always a unique and popular brand at craft fairs and events, amongst both shoppers and event organisers alike. Become a Reseller of Scentopia Today! Whether you want to sell to friends, co-workers, neighbours, at craft fairs, trader events or use it as shop stock, we want to make sure Scentopia fits your lifestyle. Buy starter kit and future stock as required. Add Point of Sale items, from branded price and information cards, to table display kits, right up to the full exhibition stands. making it easier to cover your table and make a profit, even at quiet events. Scentopia products are already legally certified, saving £hundreds in business set-up. Recognised by customers, and especially by event organisers, who tend to seek you out for their upcoming events. Established brand with proven sales. Having been established since 2014, we've honed into what products sell well. Just a minimum first order from us, to ensure you have sufficient stock for a minimum display and sales. Sell Scentopia in a way that suits you: be it hobby, casual or part-time venture, you don't work for us so we won't make demands on your lifestyle. Order dispatch within 48 hours of payment. As resellers, you are important to us, so we endeavour to get stock to you as you need it. Personal service, help and advice to resellers. Got questions? Unusual requests from customers? We are always intereted in tailoring Scentopia to new and exciting ideas and addressing customers needs. Decide how much or little you want from Scentopia: a minimum starter kit, Point Of Sale items or area-exclusivity. Contact us at scentopiauk@gmail.com stating that you are interested in becoming a reseller, and what you might need. You can decide to stop at any time, and as mentioned earlier there is no minimum onging order (unless under area-exclusivity deal)... and you can buy Point of Sale materials or upgrade to area-exclusivity (where available) at any time. So contact us with any questions - we want Scentopia to work for you. The cancellation period will expire after 14 days from the day on which you acquire, or a third party other than the carrier and indicated by you acquires, physical possession of the goods (or the last good, in the case of multiple goods ordered in one order and delivered separately). To exercise the right to cancel, you must inform us, Scentopia, of 26 Bransby Way, Weston-super-Mare, BS24 7BW (scentopiauk@gmail.com) of your decision to cancel this contract by a clear statement (e.g. a letter sent by post or e-mail). You may use the attached model cancellation form, but it is not obligatory. It is our responsibility to supply you with goods that meet your consumer rights. If you have any concerns that we have not met our legal obligations or if you are at all unhappy with our products, or any aspect of our service, please email us at scentopiauk@gmail.com as soon as possible with your name, address, product name and date of purchase where applicable, and details of your complaint. We will endeavour to respond within 24 hours, with a view to solving the issue as soon as possible.